In 2016, The Witness will profile priest jubilarians celebrating their 25th (silver), 50th (golden) and 60th (diamond) anniversaries of ordination. This week is dedicated to the diamond jubilarians. Father Gerald A. Condon, who retired in 2000, was born May 4, 1930, in Cedar Rapids to Fred and Irene (Cramer) Condon. He graduated from Immaculate Conception High School in Cedar Rapids in 1948 and from Loras College in Dubuque. He completed his theological training at Mount St. Bernard Seminary, also in Dubuque. He earned a master’s degree in education from The Catholic University of America in Washington, D.C., in 1963. He was ordained Feb. 4, 1956, at St. Raphael Cathedral in Dubuque by Archbishop Leo Binz. He served as associate pastor of St. Patrick Parish in Ryan, 1956-58. He was the associate pastor at Immaculate Conception Parish and faculty member of St. George High School, both in Lansing, 1958-63. He was assistant principal of Regis High School in Cedar Rapids, 1963-66, and associate pastor of St. Nicholas Parish in Evansdale and faculty member of Columbus High School in Waterloo, 1966-67. He served as principal of St. George High School in Lansing, 1967-73, and associate pastor of St. Joseph Parish, New Albin, 1967-70. He was resident administrator of Immaculate Conception in Wexford, 1970-73, while also serving as executive coordinator of St. George High School in Lansing, 1971-73. Father Condon was principal and executive coordinator of Don Bosco High School in Gilbertville, 1973-83, and temporary administrator of St. Mary of Mt. Carmel Parish in Eagle Center and Immaculate Conception Parish in Blessing in 1980 and temporary administrator of St. Francis Parish in Barclay in 1981. He was pastor of St. Matthew Parish in Cedar Rapids, 1983-93, and St. Patrick Parish in Hampton and St. Francis Parish in Dumont from 1993 until his retirement in 2000. He served on the Clergy Conference Planning Committee, 1971-74; dean of the Cedar Rapids Deanery, 1991-93; and dean of the Webster City Deanery, 1994-2000. He also served on the Archdiocesan Pastoral Council, Priests’ Council, Personnel Advisory Board, St. Raphael Priest Fund Society and the Priest Pension Plan Board. He was president of the Northeast Iowa High School Principals’ Association, 1972-73. Father John Herzog was born Nov. 3, 1931, in Zwingle to William and Kathryn (Walsh) Herzog. His home parish was St. Joseph’s on the Prairie, near New Melleray. 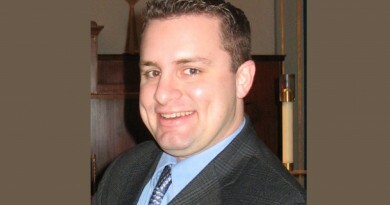 He graduated from Loras College and completed his theological studies at Mount St. Bernard Seminary, both in Dubuque. He was ordained Feb. 4, 1956, at St. Raphael Cathedral by Archbishop Leo J. Binz. He was associate pastor of Sacred Heart in Monticello, 1956-61; St. Joseph’s in Waterloo, 1961-63; and All Saints in Cedar Rapids, 1963-69. He also served on the faculty of Columbus High School in Waterloo, 1961-63, and Regis High School in Cedar Rapids, 1963-69. He served as executive coordinator and principal of St. John’s School of Religion in New Hampton, 1969-73. He was pastor of St. Mark’s in Iowa Falls, 1973-85; Sacred Heart in Eagle Grove, 1985-87; and St. Patrick’s in Nevada and St. Mary’s in Colo from 1987 until his retirement in 1999. He served as archdiocesan director of the Cursillo Movement, 1976-82. In 2002, Father Herzog took a course at Clarke University to prepare for a role in Hispanic Ministry. Since then he has been involved in ministering to Spanish-speaking Catholics in the archdiocese. He currently celebrates the Spanish Mass at St. Cecilia Parish in Ames each Sunday and celebrates Spanish Masses at other parishes on occasion, including St. Patrick Parish in Tama. He routinely assists in the ministries at the parishes in Colo and Nevada since his retirement. On the day of his anniversary, a small gathering was held at St. Thomas Aquinas Parish in Ames. A larger celebration was held on Feb. 7 at St. Cecilia Parish, which involved English and Spanish speaking parishioners. Msgr. James Barta was born Oct. 22, 1931, in Fairfax to Omer and Bertha (Brecht) Barta. He graduated from Loras College in Dubuque and completed his theological studies at the North American College in Rome where he was ordained Dec. 17, 1955, by Most Rev. Martin J. O’Connor, the seminary rector. He served as assistant pastor at St. Wenceslaus Parish in Cedar Rapids, 1956-57, and was appointed to the faculty of Loras College in 1957. He did graduate studies at Fordham University in New York, earning a doctorate degree in psychology. He served at Loras College for 37 years, as professor, academic dean, academic vice president, acting president and president. While there, he established and was the first staff member of the college counseling center. During the first 30 years, he was also chaplain at Clarke College. In 1994, he was named episcopal vicar for the Cedar Rapids Region and was archdiocesan consultor for two five-year terms. In 1999, he was named vicar general and became a member of the Archdiocesan Finance Council and the Archdiocesan Investment Committee. He was named a prelate of honor (monsignor) in 1987 and a prothonotary apostolic in 2004. He retired in 2009 and now lives at Villa Raphael in Dubuque, is chaplain for the BVM Sisters at Marian Hall, Mt. Carmel, and is spiritual advisor for a number of priests, seminarians and lay people. He celebrated with his family at a reunion in August and liturgically with a Mass of Thanksgiving at Mt. Carmel. Msgr. Walter Brunkan, pastor of the linked parishes of St. Mary in Greene, St. Mary in Roseville and Holy Name in Rockford, was born Aug. 5, 1930, in Dyersville to Anton and Mary (Heiring) Brunkan. 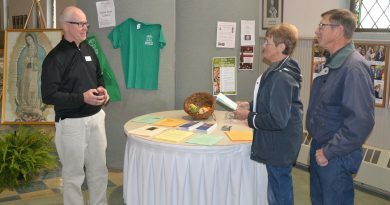 He graduated from Loras College and completed his theological training at Mount St. Bernard Seminary, both in Dubuque. He was ordained Feb. 4, 1956, at St. Raphael Cathedral in Dubuque by Archbishop Leo Binz. 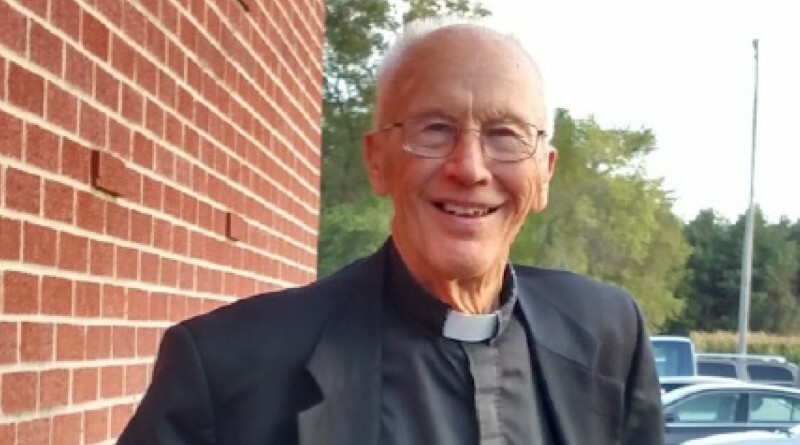 He served as associate pastor of Immaculate Conception Parish in Charles City, 1956-59. He was appointed to the faculty of Columbus High School in Waterloo in 1959. He served as executive coordinator and principal of Columbus from 1968 to 1991, while also serving as the metropolitan coordinator of Catholic education for the Waterloo-Cedar Falls region, 1989-90. He was named a prelate of honor (monsignor) in 1991. He was pastor of Immaculate Conception Parish in Allison, 1991-92; St. Mary Parish in Greene since 1991; and St. Mary Parish in Roseville since 1992. He was appointed archdiocesan consultor in 1994. He has been pastor of Holy Name Parish in Rockford since 2012. A celebration, sponsored by the three parishes where Msgr. Brunkan currently serves, was held in Greene on Feb. 7 to mark the 60th anniversary of his ordination. Father Phillip Schmitt, who retired in 2000, was born Nov. 20, 1930, in Marble Rock to George and Estella (Grace) Schmitt. He was ordained on Feb. 4, 1956, at St. Raphael Cathedral in Dubuque by Archbishop Leo J. Binz. He served as associate pastor of Nativity in Dubuque, 1956-58; Assumption in Cresco, 1958-63; and St. Joseph’s in Bellevue, 1963-70. He also taught at The Visitation Academy in Dubuque, Notre Dame High School in Cresco, and Marquette High School in Bellevue, while serving in those towns. In the 1960s, he also participated in the War on Poverty, serving on the board of directors and later as president of Community Action, an organization that provided aid to the poor, including a mentoring and early childhood programs. Father Schmitt was a licensed pilot for decades and is a charter member of the National Association of Priests Pilots. He was executive coordinator and principal of Marquette High School in Bellevue, 1966-77; and administrator of SS. Peter and Paul Parish in Springbrook, 1970-77. Father Schmitt was a member of the faculty of Columbus High School in Waterloo, 1977-80. He was pastor of Holy Trinity in Walford, 1980-85; and metropolitan coordinator of the Catholic School System in the Cedar Rapids-Marion area, 1980-91. He was pastor of Immaculate Conception in Cedar Rapids, 1985-91; and St. Mark’s in Iowa Falls from 1991 until his retirement in 2000. 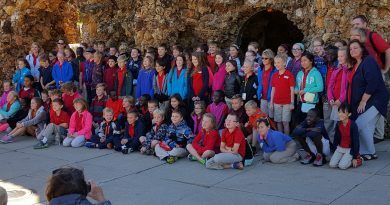 When still on active duty, Father Schmitt helped out with Christian Experience Weekends in Dubuque, Cedar Rapids and Waterloo. He also served as chaplain at Kirkwood Community College in Cedar Rapids for 20 years. He has been spiritual advisor of Engaged Encounter since the mid-1980s and a member of the board of directors of National Marriage Encounter since 1983. He has also served on the advisory board of Teens Encounter Christ (TEC). Father Schmitt now lives in Mt. Vernon, where he assists at St. John the Baptist Parish and other area parishes. He also visits Anamosa State Penitentiary regularly to celebrate Mass as part of Catholic Charities’ prison ministry. A small anniversary celebration was held on Feb. 4 to mark his jubilee and a larger celebration is planned at St. John the Baptist, Mt. Vernon on June 5.